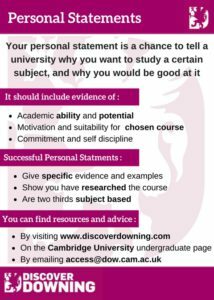 Writing a personal statement can be a daunting task – and it can be difficult to find the relevant guidance and information. We’ve collated our personal statement information regarding applying for Cambridge into the three headings below. The content is adapted from the ‘Cambridge Explained’ power points delivered at our outreach events. 1: How are they used? To confirm the appropriateness of the chosen subject. To confirm your commitment and organisation. As a starting point for discussions at interview. This means that your personal statement should be focused on why you are a suitable candidate for your chosen course, as well as highlighting the key skills that will make you a successful university student. Any wider reading or subject experience mentioned could be brought up in your interview- so make sure it’s content you’re comfortable with (and have actually read!). 2: What should I include? You only have 4000 character (or 47 lines) which works out at around 500-600 words. It should therefore be concise and to the point – cut out any flowery language or unnecessary detail. 3: What makes a successful personal statement? The best personal statements are specific. It’s better to discuss fewer interests in depth, than simply list a range of extra reading and achievements. Think about what you’ve learnt, what you think, and any links between topics. They should be 75-80% subject based. Extra curricular information should be condensed into a closing paragraph and linked to relevant wider skills. Keep a log of any super-curricular extra reading, podcasts, or subject exploration as you do it. Get teachers, friends, parents and/or pets to read it – but remember it should be your own personal work. Remember you can visit our resources page for inspiration!